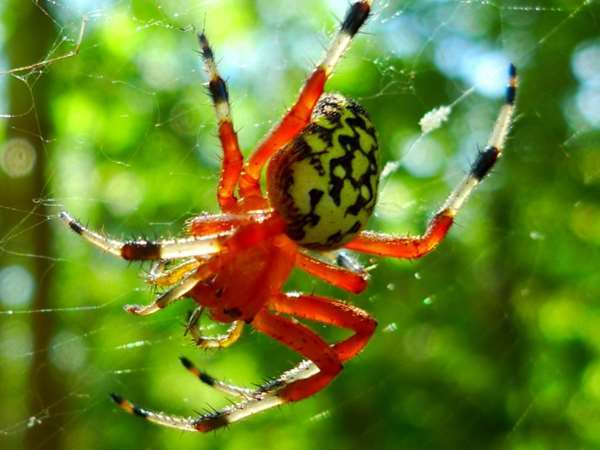 Among the general public, Illinois Spiders do not reach the popularity of birds, butterflies and dragonflies as subjects during your basic nature identification hikes. As a result, estimates of the number of species of Illinois spiders tend to fit some where in the in the 800-900 species range. With two noted exceptions, Brown Recluse spiders and Black Widow spiders, Illinois spiders can be considered beneficial because they prey on pest insects such as mosquitoes and flies. And of course a nod to the spider faint of heart. OK, Illinois spiders may be beneficial but they can also be a bit creepy. With respect to the spiders of medical importance in the state, it’s important to note that Black Widow spiders can live in most urban and residential areas. They build their webs close to the ground, In residential areas, they might have webs near woodpiles and stumps around the backyard. They prefer to avoid all human contact. A recent article in the Journal of Medical Entomology (2014) researched the question of Brown Recluse in Illinois and concluded. In Illinois, brown recluse spiders are common in the southern portion of the state and dwindle to almost nonexistence in a transition to the northern counties. Although there were a few finds in the Chicago, IL area and its suburbs, these are surmised to be human-transported specimens and not part of naturally occurring populations. Almost nothing says Illinois spiders like the orb weaving spiders familiar to all. The basic circular web spun by a spider for a day’s worth of hunting is a common site in yards around the state. If fact, they are so common in residential areas, fields, forests and grasslands that they receive an honor not bestowed on most spiders, common names. The list shows the formal and in many cases common names of around twenty different orb weavers. 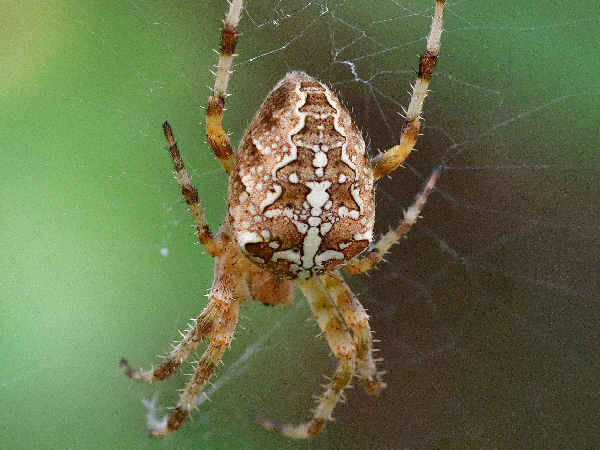 Eleven species belong to the genus Araneus, the most diverse group of orbweavers in the United States, with anywhere from forty to fifty identified. Approximately 20% of them can be found in Illinois. 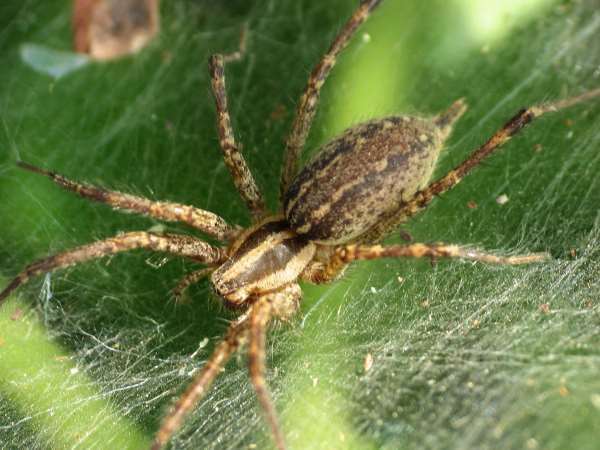 For visitors interested in more detailed spider identification, the odds are high that at least a couple will show up in the average back yard anywhere in the state. The first two pictures show a Garden Cross Spider and the Marbled Orbweaver. Both belong to the Araneus genus and the pictures highlight the color range of the spiders as well as the diverse patterns on the bodies. A handful of additional spiders build webs and are very visible around residential areas. Common Illinois house spiders such cobweb spiders and cellar spiders share the home with some lawn spiders that occasionally find their way into the home. The picture shows a common funnel web spider. A look at the grass in the early morning dew will often reveal many spider webs with a funnel shape. The grass spider, like the one pictured, sit in the web awaiting their prey for the day. A quick garden spider survey also finds a handful of spiders that do not build webs. 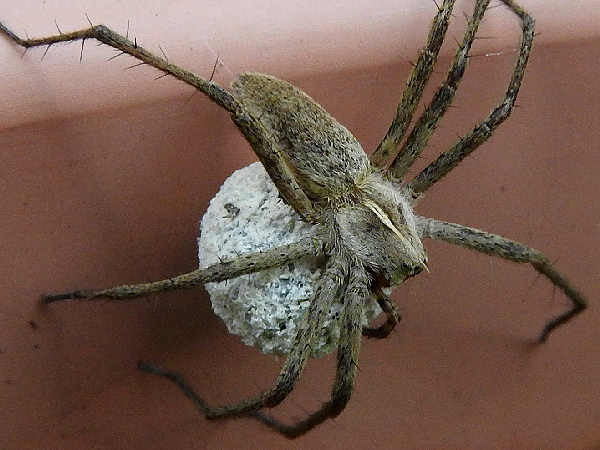 They have common names such as crab spiders, lynx spiders and wolf spiders. Pictures and additional information covering those species can be found by pressing the spiders button. Spiders in the Pisauridae family can grow fairly large, so they often catch the eye of the average person. They go by two common names, Nursery Web spiders and Fishing Spiders. Nursery Web spiders can look like wolf spider, brown or muted color bodies with some striping or patten on the body. Females carry their egg sacs in their jaws. The name nursery web spider refers to the fact that as the spiderlings hatch, the egg sac is placed in a bunch of leaves for safety. The picture shows a Nursery Web spider. The name fishing spider almost tells the entire story. They do catch and eat small fish they see while they sit quietly by the water’s edge. Jumping spiders abound in Illinois back yards, fields and forests. Because they rank as the spider family with the largest number of species in the United States (over 315 species), it’s a sure bet that dozens of jumping spider species call Illinois home. 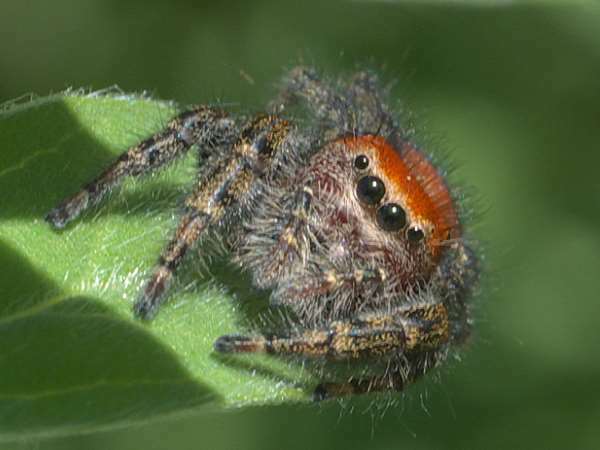 For visitors interested in jumping spider identification further than the family, the list shows a dozen species that are common in residential areas and parks.